Dr. John Harrelson provides tips and strategies for gardeners to prevent injuries to backs, shoulders, necks and wrists. Unfortunately, There is an audio soundbyte on this page, but your browser does not support the playback method. This is “Getting Dirty in Your Garden”, brought to you by North Carolina State Extension master gardener volunteers. I’m your host Harold Johnson, and I’m a master gardener in Durham County. A hint of spring greets you one morning. Your garden and landscape beckon you to venture outdoors to tackle the usual spring chores: shrub planting, maybe pruning, adding compost or soil to a growing bed. It seems spring not only signals plant growing time, but also a growing list of gardening tasks. A Durham County Master Gardener volunteer and retired physician, Dr. John Harrelson shares tips on preventing excessive aches, pains and sprains brains with the always roving reporter Charles Murphy. Hello again! This is Charles Murphy, North Carolina State Extension master gardener volunteer in Durham County and enthusiastic master gardener, and today I am talking with John Harrelson, who is also a North Carolina State Extension Master Gardener volunteer in Durham County and a retired orthopedic surgeon from Duke university and this afternoon we are talking about how to garden safely, how to garden without provoking injuries, how to garden without making any existing conditions worse—in other words, how to enjoy your gardening more and regretting it less. John, thank you for coming and talking about this with us. What I would like to do this afternoon is just to start off by asking you what kinds of common injuries are gardeners susceptible to? Charles, the U.S. Consumer Product Safety Commission’s looked at that and figures are kept. The most common are injuries of the back. Typical injuries are sprains and strains, but also shoulders, neck and wrists, I think are areas that are often a problem in the garden, particularly as we get older and are maybe a little less flexible than we use to be. …So, upper body injuries, especially, then. It’s winter, or at least it’s supposed to be winter on the calendar. It’s not quite here for us—late December—but things are slowing down and gardeners are slowing down as well. It’s going to be time before long to start looking at seed catalogs, watching bowl games and not doing a lot of other things, actively. Are there things or tips you would suggest for gardeners to stay in good condition over the winter while things are kind of dormant? One of the things I do is to try and take walks on a regular basis. One of the things we have to our good fortune in this area is a number of nice places to walk, both in Durham and over in Orange County. And I will try to talk about a mile or a mile and a half walk 2-3 times a week. During the summer I don’t need that, but during the winter when gardening activities are less and physical activity generally diminishes, I find that a good way to warm up. That and do some stretching exercises. As I have gotten older, I’ve gotten stiffer. Stretching seems to make a big difference for me. Okay, should I be doing anything? I mean. I know that if you are inactive, especially if you are not working muscles, specifically, that they tend to lose some of their suppleness and they also tend to lose some of their power over time. Is there anything I can do during the winter that would help prevent some of that loss? Well, yeah, resistive exercises like weights or riding a bicycle—walking, I think, will keep your legs in good shape. If you wanted to get some light weights to work out—do some upper-extremity weight work, that would be fine. Unless your daily activities give you enough of that during the winter, that would be a nice way to add to it. I think you can keep it light, but do it regularly; you reduce the possibility of strain. Let’s take these sort of one category at a time–shoulder injuries, for example. What kinds of things, in your experience, would be likely to either cause a shoulder injury or aggravate a shoulder problem, if you have one. You are talking to a guy who has had two shoulder cuff tears—one on each side! [Laughter] Experience helps! This is a spring time injury, interestingly, and not just for gardeners. People haul out the lawn mowers they forgot to have serviced, or perhaps the weed eaters they forgot to have serviced. They start yanking on a cord trying to get cranky machine to start and they wind up with a shoulder cuff problem. It may not be a complete tear, but it can be aggravated or give you bursitis about the shoulder. So the first tip for shoulders is now that winter is here, get your tools to a service place, get them new spark plugs, get them clean, put a fuel stabilizer in and make sure they are in working order before you put them away for the winter. Then they are ready to come out to work in the spring time. It wouldn’t hurt to do again, some light resistive shoulder abduction exercises as sort of a routine to sort of help keep your shoulder muscles in shape. You can do that; you can use a light weight, a rubber or cord that has stretch-ability to pull against. But keep it light. You are not trying to break records, here. Okay, well let’s suppose we have done what we can to stay reasonably healthy and in good condition over the winter time. Now it’s time to start thinking about getting into the garden, getting some early things in, maybe like early peas, or getting the beds ready for things that are going to come later on. So, in late winter or early spring, what sort of injuries or what sort of things do we need to be thinking about and taking into consideration? Well, I’d say the first thing–before you get out and start your gardening activity in the spring–is to do some warm-ups. Start with about 10 or so minutes of stretching before you go out. Maybe take a short walk to warm up so you are physically tuned up before you pick up the shovel or rake, a rototiller, a hoe or anything else. In terms of what you are doing in the garden, I think the other thing we talked about having your gas-powered tools taken care of—just make sure your tools are sharp: like your hoe, your shovel, your trowels, or the things you are going to be using are not caked with rust. Your pruners are clean and oiled. The sharp tool—you are less likely to injure yourself with [as] an adult. So those would the things to do in the spring or over the winter. The other thing is that when spring comes along. You have been indoors all year or all winter. The sun is going to be out. Along with that comes the insect. You want to think about protecting yourself from too much sunburn with a good wide-brimmed hat, some sunblock on exposed areas. I am very fair-haired and have, I think, put my dermatologist’s first child through college from sun injury over the time. Also, be sure to stay well-hydrated. You’re going to be perspiring, which you have not done much over the winter, so take some water with you to the garden. The other thing is break your work up. Don’t do the same thing for an hour and ½. Do 15-20 minutes of one thing. Then do 15-20 minutes of something else, so you are using different muscles, different body positions. That also reduces your likelihood of strain or injury. Okay, now thinking about doing things like getting the beds ready and one thing like that. Something that occurred to me while we were talking about that [is] choosing the right tool. By that, I don’t necessarily mean picking up a hoe when you really need a rake, but right for your build and right for your size. Would you say anything about that? Well, I have had to pay some attention to the type of tools I have used because as I have gotten older, I have also had problems with low back arthritis and I have a fair amount of arthritis in both wrists. Many gardening tools, if you think about holding a rake, you put a rake in on the ground and you grasp the handle with both hands and your wrists are deviated toward the little finger. For me, that’s an uncomfortable position. The same is true if you take a garden trowel and you are going to dig something. You hold it in your hand and then you have to point it at the ground to do your work. Those things, I’ve found very painful, or at least enough discomfort that I don’t enjoy doing it. There are ways to deal with that if you have a problem with your wrists. There are tools designed with a curved handle, so if you work a trowel, for example, without having to bend your wrist. You can get handles that you attach to a rake or a shovel that are at right angles to a shovel so you can hold the handle with these two attached grips in whatever position is most comfortable for you and not have your wrists bent down and strained and using it in a conventional manner. The other thing, for me, too, was to get rid of –not get rid of—to diminish the use of my wheel barrow. Particularly, if I have got to move some top soil or something that is heavy, because you are rolling on one wheel and you’ve got to control it left and right. If there is a little slope in your yard or you hit a bump or a rock, it can be a problem. A four-wheel cart is ideal. These are available—you can find them online. Two-wheel carts [are] the same way. They have a balance and you might find it easier to pull rather than to push. It is often easier to pull something behind you than to push it in front of you. That’s another thing. For my back, bending over is uncomfortable. My daughter, one of my thoughtful daughters, sent me a gardener’s bench, which is a bench that sits about 2 feet off the ground–2 ½ feet–and it has legs on both sides and its padded on both sides, so if I needed to get down lower, I simply turn the bench over and I’ve got a kneeling pad and the two legs are a way for me to get from the ground easily without straining my legs or my back. You can also buy knee pads if you need to spend some time low down on the ground doing things. I’ve found raised beds have helped me with that, rather than planting in the ground. Those are some of the things that I’ve done to modify my tools to make my gardening more pleasant. Now that sounds like an interesting idea. If a gardener wanted to modify his or her tools, for example, if I’ve gone into a number of gardening shops over the years, I don’t remember ever seeing much in the way of a lot of these things on the shelves or on the walls. If somebody wanted to try to get one, what would be a good way to go about it? One of the things that I did was to go online and look at tools for people with arthritis. Search those two words or gardening tools/arthritis and that’s where I found a number of the tools that I have since purchased or add-ons that I’ve done to modify my tools. I can’t think of any of the websites right off, but I don’t think that would be hard to find. If people are having trouble, they can give you a call [laughter]. Or me! Or one of us! Okay, alright—we’ll do it! I suppose a general Google search or something like that would be in order because you can usually turn something up that way. The other thing that I have a problem with, personally speaking, is my wife is about 5 feet tall. She just clears 5 feet; I am over 6 feet. Her favorite garden spade is about 3 and ½ feet long. I probably shouldn’t be trying to work with that, should I? I probably would classify you as a “two shovel family”! [Laughter] It depends on whether or not you could put add-on handles or add-on grips to long handle so that you could use it and are not required to have two. She might be able to use that with the handle sort of behind her as she works. Like you, I have a short shovel and a place where I hang it. And it stays there! I used to use it, but I find that I don’t much anymore for that very reason, that I am bending over to use it. One of the other things—raking leaves—you rake leaves with a nice garden rake and then you have to bend over to pick up the leaves and if you look around online, you’ll find a rake that also has a scoop attached to the handle, so that once you’ve got a pile, you can put the rake on one side, the scoop comes up from the other side and you can lift leaves without having to bend over and stuff them to the…or pick them up with the rake. There are a number of things like that online that you may or may not need. But there are ways to make your gardening easier and your outdoor time more fun. Well, I really like the idea of the rake with the scoop on it, because you are right. After loading two or three bags full of leaves, it begins to get tiresome—tiresome in the lower back! Speaking of the lower back and injuries or aggravating conditions, summer’s coming on, spring’s coming along. I’m going to want to do some amending on my raised beds. I’ll probably go somewhere and I may buy some bagged compost because I am not really developing much compost myself. Maybe even some bagged soil mix or something like that. I’m going to have to lift from one place to another—lift from the cart at the store to the car, lift off the car to my wheel barrow, lift off my wheel barrow to where I’m going to be using it. It’s a lot of lifting—and a lot of bending! What do I need to be careful with; how do I need to handle myself? Well, the first rule of protecting your back when you’re lifting something is to do the lifting with your legs, so that you don’t bend over with your knees straight pick something up and use your back to become erect. You squat down with your back straight. Grasp what you are going to lift and do that by lifting with your legs. I think if you can concentrate on doing that, that’s one good way to protect your back. The other thing I’ve done is, if at all possible, get the company that you buy the bags from to load it for you. I have a light pick-up truck and that’s what I do and even if I’m getting a load of loose mulch or top soil. With my tailgate down and my wheel barrow parked right under the gate, I can simply stand straight and rake it into the wheelbarrow. The key there is don’t put too much in it. Don’t try to do the whole thing in six trips when twelve would be easier on you. The walking that you do—the extra walking—is helpful anyway. The other thing I think that is something to think about is called the buddy system. If you are faced with a task that’s going to be some heavy lifting or heavy work, it’s to find a fellow gardener and the two of you team up and each of you help the other with tasks that require more force than you’d like to be able to do. That, or as I tell people, I used to refuse to pay anyone to do something I thought I could do. Now I have moved into a phase of life I call my “get a guy” phase where I get someone to help rather than injure myself by trying to do what I used to do when I was 20 years younger! Well that sounds like a good idea! One other thing, as long as we’re talking about lifting or carrying—let’s suppose that I followed your advice and I lifted this 25 pound bag of whatever it is by keeping my back straight and using my legs and I got it up. Now, I’ve got to move it about 25 feet from where I am to my bed. How should I carry this? Well, I would put it on something with wheels, rather than try to carry a weight that distance. And that’s the other thing to think about. If you’ve got a wheelbarrow and you’re comfortable with that, and 25 pounds is controllable and it’s a level surface, then that’s fine. Otherwise think about getting a two-wheel or four-wheel cart and make sure that it has got big enough wheels, because small wheels don’t do well in mulch or on lawns. You want wheels that are big enough to roll comfortably over whatever terrain you have to do. The other thing is, if you’ve got it in your wheelbarrow or if you’ve got the bag, divide it. Take part of it in the wheelbarrow and then take the other part. Don’t try and carry the whole 25 or 40 pounds! You find a 25 pound bag of something, I’m not sure what it is, most of them are 40 pounds and up. Particularly, if you are going to go for garden soil or whatever, and they’ll be ones that are really two-men jobs or one where you have to divide it up and use an appropriate cart. Now, that sounds like a good idea! Okay, now let’s think about moving along, then, to the high gardening season. It’s spring and you’ve gotten in the tomatoes and gotten the beans planted and things like that. I’m going to have to be doing a lot of work outside, weeding and keeping up with things, checking plants and it’s now summertime! What do I need to think about and how do I need to protect myself? Okay, well, we start at the top. I would start with sun, again. We can talk about this—in the springtime—it’s sun protection—it’s cumulative, sun damage is cumulative. The older you get the more likely you are to have problems relative to that. So, get a wide-brimmed hat, use sunblock. The next thing for me, out here where I live, is ticks. Ticks are very common. I’ve sustained tick bites almost every summer until recently and even got a case of tick-borne fever one summer. There is a product you can get that contains a chemical, called permethrin that is a good tick repellant. It’s one that you don’t put on yourself. You treat your clothes with it; let your clothes dry and then you can don those clothes. I have two pairs of garden pants and two long sleeved shirts, and two pairs of gardening socks. I put those on; they are good for about four or five washings before you have to retreat them. I spray a little “deet” [a brand of diethyltoluamide], you know “OFF” or some equal brand on my shoes and I tuck my pants inside my socks. I haven’t had a tick in the last two summers just from doing that. Be aware of ticks. The other thing is that it’s getting hotter, particularly if you are wearing a long sleeved shirt and long pants and a wide brimmed hat. One thing I always take to the garden with me is water. I have a one gallon water jug that I carry that has its own cup and I specifically pause every 15 or 20 minutes and take a drink of water or two just to make sure I am staying hydrated. Anything else come to mind that you’ve encountered over the summer? I think one thing that I’ve had a problem with is persisting outside too long or persisting on the job too long. There’s just a little bit more to finish it and I’m going to stay out here and finish it! You know how that is. I think the time to garden is in the morning and in the evening. If you can avoid the heat of the day, that’s a good way to take care of some of the problems we have already talked about. I will go back to what I said earlier about “Don’t do the same thing for longer than 20 or 30 minutes before you do something else”—take a break! Break up the work you are doing. If you persist at one task like—let’s say you’re going to spade your whole garden–and you’re going to go until you finish it, your chances of injury are much greater if you do that whole job at once, than if you do a bit of it now, then do some other things. There is always more than one task to do in the garden. You can do a bit of that, come back to it later. Planning is a part of that. Pick the time of day and stay out of the noonday sun. Okay unless you are a mad dog or an Englishman! I have been accused of being a little off in the past! I have noticed personally, that I have become more susceptible to wear and tear and the heat than I used to be. I’m not as able, nor do I want, to stay out as long as I used to want to stay out, so we’ll be careful about covering up; be careful about using proper clothing; be careful about using proper tools. We’ve got a good garden, now, it’s going well. Late summer time—it’s time to start talking about fall garden. There’s going to be a lot of leaf drop and there’s going to be a lot of other things going on in the garden and in the yard; anything in particular that we need to think about here? Okay, we’ve not talked much about feet or ankles, but I think in particular in those situations, where you are cleaning out a bed or cleaning out fallen limbs or you’ve done some extensive pruning is take the time to move that work aside so that you are standing in a clean work space and you don’t turn around and suddenly find a limb between your legs and turn an ankle or worse yet, fall on an outstretched arm and injure your wrist or elbow. So keeping the workspace clean is one thing. All the other things, I think, still apply—making sure you have sharp tools that are in good shape. The other thing I would caution against is trying to work overhead, particularly with a chainsaw. Chainsaws belong out in front of you. Don’t ever try and prune something overhead with a chainsaw. If you are going to use a pole-saw to try to get a high limb off, grasp it with your hands in front of your chest and move up and down there. Don’t stick your arms up in the air to do that. That’s one way to strain your shoulder cuff and wind up with some shoulder discomfort as a result. Pole-saw won’t reach it, and the limb has to go? Get somebody to do that for you! Don’t go up a ladder with a saw, is my advice. At least at my age! [laughter]. If you are going to work overhead, where things are above you, make sure you wear a hard hat—I have a contractors’ type hat that I wear, and I put on eye protection. I have had the problem of having a branch scratch my cornea on a couple of occasions—not just from overhead work, but driving by a bush on my lawnmower or tractor and having a branch catch me in the eye. The third thing for me is ear protection. If you are using gasoline powered tools, almost any one of them generates enough volume to damage your hearing, or potentially damage your hearing, so earmuffs, or plugs, I think, are a cheap, very valuable investment. I already have some hearing loss as a result of my not paying attention to that. That would be the other thing to consider. I don’t know if that particularly relates to fall or whatever, but these are some of the things that we haven’t talked about, that might bear mentioning. I’m glad that you mentioned—especially glad you mentioned hearing the protection and eye protection, because you’re right. There’s no such thing as a quiet lawn mower–even an electric lawn mower. Last year I went to all-electric gardening outdoors in my lawn—this is my goal—has been my goal. Okay, get rid of the gasoline machines. I know I’ve seen a few advertisements in magazines and things for electric lawn mowers and they always say, “You can carry on a conversation, while you moving your electric…” well I’ve found that you can’t. It’s not noisier than you think it is. It is not as noisy as a gasoline engine, but it still makes enough noise that I’m much more comfortable wearing my ear protection than not doing it with that. Eye protection using the weed whacker going around the sidewalk or something like that and it’s amazing how stuff flies out from under there. Yes, I’ve broken my daughter’s car window and my front window using the weed-eater in that manner. I have two acres in the yard with all hardwoods and so I drive a tractor pulling another cart with its own 6-horse power mower, [laughter] so…my head and ears and eyes are all covered up! Well, you truly do have to be careful about it. Too often some of us (and I’ve certainly been guilty of this in the past) well this is just a little something that I need to run the mower for, or a little something that I need to run the weed whacker for…or just a little space I need to blow the leaves off of and I just don’t want to run back in and get whatever protection I might need, and I think it would be good for all of us to consider all those things before we start. Yeah, and I think a little ritual—a gardening ritual—I get out, I put on my gardening clothes, I get my gloves, and that’s something else that we ought to mention, too—if you haven’t had a tetanus immunization in the last ten years, you ought to get one. They don’t last a lifetime and tetanus is extremely uncommon now, but largely because of immunizations. Talk to your doc, and I think that’s something you can just drop by the office and get one of, if you haven’t had one in recent years, within ten years, I think is the recommended timespan. The other thing is if you do get an injury–I think you protect your hands best with gloves. It doesn’t take much—a rose thorn injury, for example, can give you really a nasty infection. Don’t take little puncture wounds or splinters lightly. Remove the splinter, obviously, if you have that. Treat the wound with an antibiotic ointment, and if it doesn’t heal up or if it starts getting red or swollen, go and have someone take a look at it and I think that’s good advice. Back to tetanus, you mean I don’t have to step on a rusty nail to get tetanus? No, that bug is around [laughter] and it lives on things other than rusty nails! Oh, okay, alright, very good! Well, it seems like every year, I can’t go through a long stretch of gardening without either sticking something in my finger—a finger, even through gloves, occasionally, if I’m working around roses, I don’t always put on the thick rose gloves that I ought to have on just to do a little grass pulling around there. There is almost always a buried thorn under the grass and things like that, again, being cautious, I find that I get little nicks, and I get little scrapes and I get this, that and the other, quite frequently when I am outside and even when I’m trying to be careful. It just happens. Well, the across-the-counter topical antibiotic ointments like Neosporin, bacitracin, polymyxin, all of these are non-prescriptions items. Cleanse the wound, good soap and water, dry it, put some on, cover it with a Band-Aid and that will take care of 99.9% of those things. It’s interesting that a large percentage of the splinters I get have come off of the handles of my wheelbarrow or the handle of an old shovel. Those wooden handles don’t last forever. One of the things that I’ve done that helps is take linseed oil and oil the handles. That tends to make the wood swell and tighten up and the splinters are not as prominent. Or you could cover them with duct tape or some other item to protect your hand from the wood or use your gloves—either way. I think we’ve got a good handle on this. I think we have gone through the things that would help all of us as gardeners to do a safer job of gardening, let me put it that way. This may not improve my skills at growing anything, but it will certainly be more likely improve my enjoyment of being outdoors and my early morning regret of having bent over all afternoon the day before, or something like that. Well, I would say yeah, that gardening is a great way to enjoy the outdoors. It’s an incredibly satisfying thing. To me, there is nothing better than sitting down to a summer meal where everything on your plate is something you grew. That satisfaction is hard to come by, otherwise. This is true. And I think this is why all of us are in gardening for—at least partly, the satisfaction of doing something like this. Well, John, I want to thank you very much for your time—appreciate it! 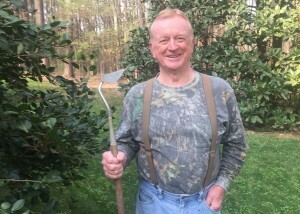 This is Charles Murphy, North Carolina State Extension Master Gardener Volunteer in Durham County, signing off again and wishing everybody a happy gardening. You’ve been listening to “Getting Dirty in Your Garden” brought to you by North Carolina State Master Garden Volunteers. You may find this and future episodes on our website: gettingdirtyinyourgarden.org. Until next time, why not go out and get dirty in your garden! • Birth of an Assassin Bug!